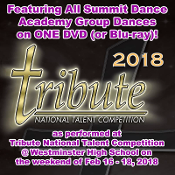 Veria Video In Association With Summit Dance Academy in Parker, CO presents Summit Dance Academy Teams at Tribute National Talent Competition as performed at Westminster High School on Saturday & Sunday, February 17-18, 2018. This is a GREAT opportunity to get ALL Summit Dance Academy Teams dance performances (for the current season) on ONE video at a real competition! We typically do not get the opportunity to film competitions, but this is that one exception! We HIGHLY RECOMMEND the Blu-ray option! Blu-ray is the higher quality choice! Select the Blu-ray Disc option in the Video Format dropdown list below! May we also HIGHLY RECOMMEND bundling your order with photos from the competition? By doing so, you can save a few $$$ over purchasing separately! Not sure about photos? Click Here to view a few samples of our work from Tribute 2015. As always, we guarantee your absolute purchase satisfaction! NOTE: This product is ONLY for the group dances. Solos, Duets & Trios may be purchased separately. Please send an e-mail to dennis@veriavideo.com if you are interested in having your solo, duet or trio filmed and / or photographed at Tribute 2018.